Today's technology permits companies to sell goods or provide services throughout the globe. Larger corporations utilize in-house counsel and today small and midsize companies may retain an attorney to provide advice and create those agreements vital to the transaction of international business. Lawyers representing business need to innovate and respond to challenging concerns and questions. A business attorney should be creative. Attorney Erskine has delivered papers at both international and domestic academic conferences, which propose new approaches to legal problems such as resolution of conflicts between fundamental rights. He has published law review articles on various subjects addressing domestic, comparative, and international law that seek to positively reform existing legal structures. To view Attorney Erskine's law review articles. In today's global economy, companies can reach a worldwide customer base. Whether you are just beginning your enterprise or looking to grow your business, laws and regulations will face you at each step of your endeavor. Navigating these legal obstacles and complying with the growing myriad of regulatory burdens is eased by the retention of an attorney skilled in the legal matters companies face in transacting globally or just around the corner from your office. As regulatory compliance burdens increase in the present marketplace, legal counsel may assist a company in ensuring compliance with these various regulatory requirements. Policies and procedures may be enacted by your company to manage regulatory compliance issues. The lawyer-client relationship results in the sharing of information for the joint purpose of receiving legal advice and providing practical solutions to workplace problems. Whether you are reviewing a request for proposals or deciding to terminate an unproductive employee, the lawyer-client relationship provides guidance on how to complete these transactions in a professional and protective manner. The goal of any relationship between an attorney and client is to ensure observance of the law and professional execution in compliance with regulations. These general areas encompass a great variety of subjects where an attorney may assist your business. Are you being sued by a customer? Have you been served notice of an arbitration or request for mediation? Having process served on you is never a pleasant experience. Nonetheless, disputes between companies and between a business and its customers occur frequently. A lawyer's assistance during the litigation process or ADR proceeding provides businesses with essential information for vital decision-making during a dispute and facilitates resolution of disagreements. Are you just starting your small business or are you an established venture? Either way you will likely need documents to protect your company and to manage customer expectations. Drafted contracts and agreements can put a professional feel to your business as well as help to ensure when problems arise that clear concise language governs your transactions. Whether you are hiring a new employee or entering into a multi-million dollar services or sale of goods contract, the assistance of a lawyer helps to identify concerns and interpret terms and conditions. Legal representation may provide useful assistance to a company owner or executive in managing diverse and challenging responsibilities.Companies need solutions to situations that emerge as a result of the everyday conduct of business. An attorney assists a company in reaching a solution to problematic situations as they arise. The speed at which current business operates necessitates quick responses to challenging questions. Legal assistance provides companies with additional vital information for decision-makers to utilize in answering these challenging questions. Explore the opportunity to consult with legal counsel to assist your company in your business transactions. Whether your business needs to adopt compliance procedures or tailor a program to update employees on key employment or regulatory issues, an attorney provides timely useful information to support your business. Ensuring employees understand and correctly apply contract or regulatory language avoids costly expenditures resulting from improper application of legal principles. Managing regulatory burdens placed upon your business by federal, state, or international governments helps you realistically assess your business' ability to cope with difficult and complex regulatory structures. Whether your business is in need of contracts, or regulatory compliance, or representation before a court at the trial or appellate level, Attorney Erskine engages in both representative and transactional situations. As you expend your time and efforts to grow your business and compete (domestically or internationally), a variety of concerns emerge about employment, contract, and logistics. Evaluating these concerns in light of legal issues or rules surrounding each of these areas permits one a wider grasp of situations as they present themselves. Attorney Erskine assists companies in various ways. 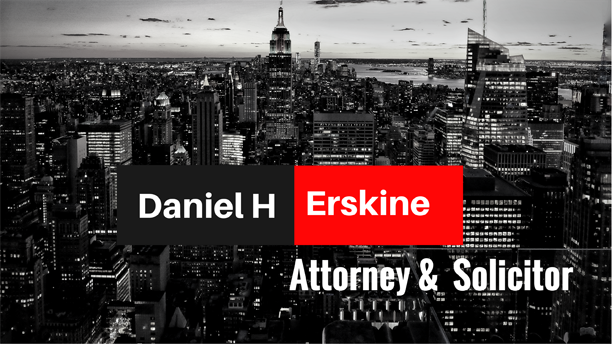 Below is a sampling of services Attorney Erskine performs for companies. Individuals and companies require advice and representation in a variety of situations. Legal disputes arise unexpectedly and often at inopportune times. Assistance of an attorney and solicitor provides clients with pertinent timely information concerning the situation and its effects. Communication of vital information by an attorney and solicitor to clients occurs across a broad spectrum of factual scenarios. Flexibility and responsiveness to ever changing circumstances are necessary legal traits in today’s quick paced world. Utilization of an attorney and solicitor facilitates navigation through procedural and administrative labyrinths. © Copyright Daniel H Erskine 2017-2018 All rights reserved.